A local family ran business, established by Sean Collins, who has over 15 years of experience in the industry. We work in all areas of roofing, carrying out private and commercial work, specialising in flat roofs. We offer a 10 - 25 year guarantee on all our work, depending on the material used. We can walk you through this on quotation. We do offer a free quotation service - simply call us today to arrange. Quality workmanship. On time. On budget. We offer the very best in roof maintenance, roof surveys and leak detection for commercial and residential properties. We had an old garage at the side of the house and we decided to convert this as part of the kitchen to the back and a sitting room to the front. As the garage was very old we needed a new roof. I was recommended Sean Collins to do this job. Sean came to look at the old roof and he told us what work was involved and quoted us a price for the job. We agreed a date with him to put the new the roof on the conversion. Sean turned up on time on the date agreed, he was very neat and tidy and efficient in his work and completed the job in a timely manner. A couple of months later when the whole conversion job was complete, he came back to check and ensure that the roof was fully sealed and that everything was in order in relation to the guttering around the roof. I would highly recommend Sean for any roof job. He was very pleasant to deal with, is very efficient and takes great pride in his work to ensure that the roof is completed to the highest standard. We're insured for up to 14M Euro - The highest possible grade in the Republic of Ireland. Insured for Public Liability & Employers Liability. Fully compliant with the Health & Safety at Work Act. Tax Clearance Certificates available on request. We specialise in providing high quality roofing installations for residential, commercial and industrial clients throughout the Dublin and surrounding Areas. We are dedicated to providing the best professional service you could possibly find. Most common signs on flat roofs is dipping, sagging and leaking. It's always wise to get this looked at and replaced before it causes internal damage which could be costly. Like all reputable companies, health & safety is key when it comes to our work. Our team are kept fully up to date with all new procedures and follow guidelines accordingly. Each staff member holds a full valid safe pass and all certs required to carry out work. We are fully registered and insured, with public and employers liability. We adhere to all Irish Building Regulation Standards. To read more about this, click here. What is the minimum pitch required for tiles or slates? This is a very common mistake made by builders etc The minimum pitch required is 12.5 degrees. If this is not achievable it's best to go with PVC system or torch on felt, both of which we supply and fit and come with a 20 year warranty. Can I stay in my home during roof works? Yes you can, we get the roof water tight through every stage of the job to ensure no leaks and no inconvenience caused to the homeowner. How do I know which roofing system would suit my building/home? We specialise and carry out many different roofing systems and can advise which is the best option for you. Web Design | SEO Ireland. 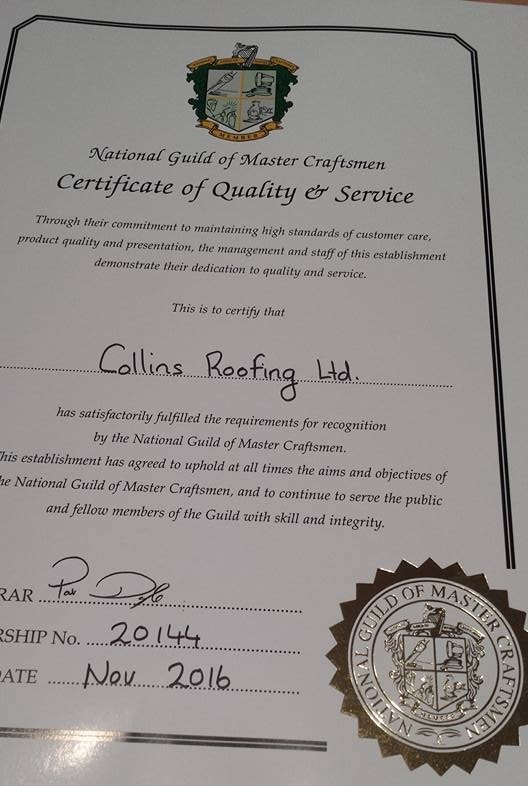 Collins Roofing, 109 Bangor Road, Crumlin, Dublin 12. CRO 540485. VAT IE3242342KH. Fully Insured & Tax Compliant in Ireland.